Activity: Is Our Phases of iPad Integration Ready? We wanted to think about developing teachers' skills at leveraging iPads for teaching and learning beyond just googling topics and word processing. Beyond just projecting material. Beyond just thinking about getting good at various tools. Beyond just using apps connected to the curriculum. We wanted to think about technology as a tool to help us customize learning. We wanted to focus more on pedagogical goals than technological goals. And we wanted to think about where technology could take us that we couldn't easily go without technology. Now, we don't believe any of our work is permanent. We know that as we get better at what we do, we'll figure out how to improve our models. 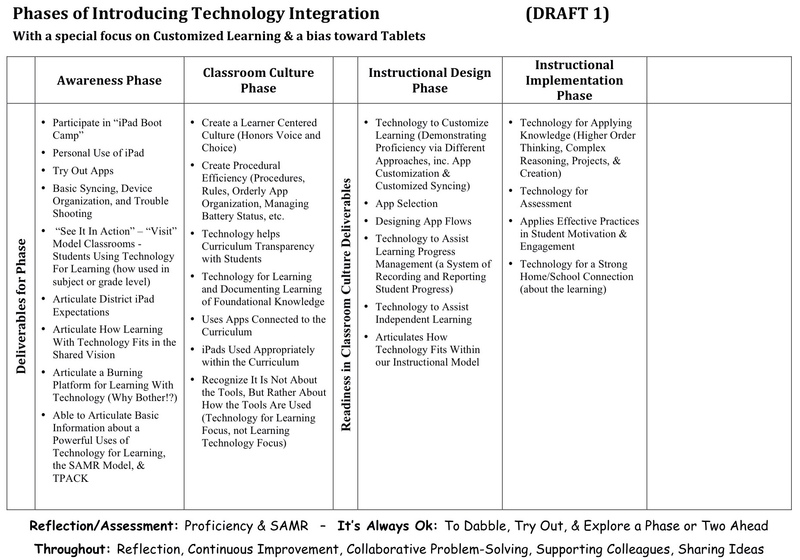 After we use this Phases of Technology document for a while, it will be ready for a revision. Does the document adequately reflect our three drivers? Does the sequence of the phases seem right? Does the progression make sense? Does each phase seem to have the right elements for demonstrating mastery and moving on to the next phase? Does it adequately outline advancement (recognizing there will be plenty of support documents)? Is anything missing? What should be added? What needs to be edited or revised? How do we make it better before living with it for a while? We don't need “perfect.” We'll learn a lot by living with the model for a while. But we want to kick the tires on this version a little, and insure it is “good enough” to live with for a while. ← Activity: What are Digital Badges and Who is Using Them?